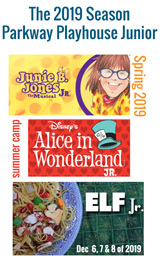 The 2019 Junior Theater Festival is quickly approaching! The festival will take place January 18th-20th, and will showcase the efforts of various theatre groups across the world. Parkway Playhouse Junior will be taking 15 minutes of Mary Poppins Jr. To make sure everyone has everything in order, we created a JTF Checklist for all of the students (and parents) who will be attending! Download the JTF app! It is currently live and contains your group’s schedules and all information regarding JTF at your fingertips! Attend the Pasek and Paul concert on Sunday at 8pm! This will be an amazing evening with even better music! Familiarize yourself with the Cobb Galleria Centre and the Waverly Renaissance Hotel when you arrive. Organize an “in case of emergency” meet up location and share that location with everyone in your group. Make sure that the emergency contacts you provided are always available by cell phone. Wear shoes at ALL times! Shoes must be worn during your adjudicated performance as well as before, and after you perform. Drink lots of water! It is very important to stay hydrated throughout the weekend! Wear all black pants, all black, flat, comfortable shoes, and either your production t-shirt (for adjudication) or your official Junior Theater Festival t-shirt (all times except adjudication). Have a nice clean face for adjudication. Wear only natural makeup (if you wish). Make sure hair is out of your face and secure so it will not go crazy during adjudication performance. Be a respectful audience member! Focus on the performance, and react appropriately. Applaud after each group has finished! Treat the other groups as friends. Let them know what you enjoyed about their performance in an appropriate manner. Listen to the adjudicator’s advice, and take in all of the information you can. Their tips are very useful!